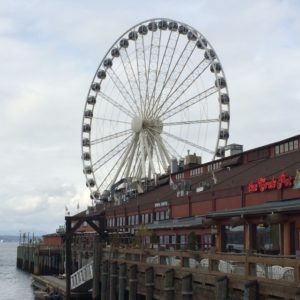 A trip is not complete without taking a walk through The Pike Place Market, but another must do is taking a spin on The Seattle Great Wheel located just below The Market on the Seattle waterfront. This giant ferris wheel located on Pier 57 takes you on a gentle ride out over Puget Sound to a height of 175 feet. You get breathtaking views of downtown Seattle, the Space Needle and Elliott Bay where you will most likely see one or more Washington State ferries crossing Puget Sound from your enclosed climate controlled gondola that seats up to 8 people. On a clear day Mount Rainier and the Olympic Mountains will be specular site and worth a few photos to take home.